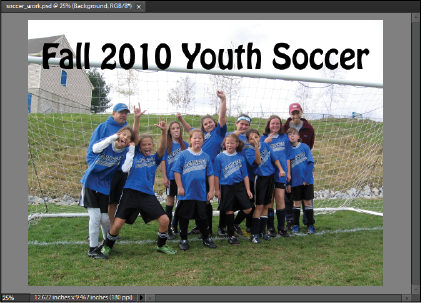 This tutorial provides you with a foundation for working with Adobe Photoshop Elements type. 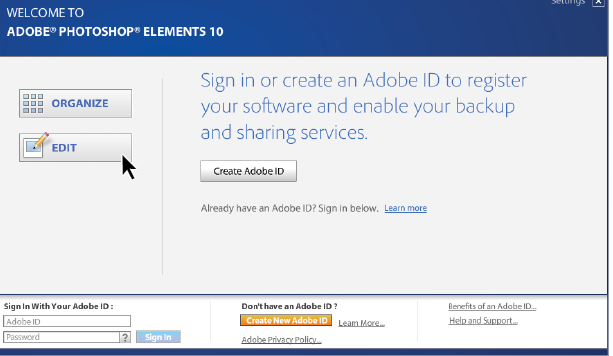 It is the seventh lesson in the Adobe Photoshop Elements 10 Digital Classroom book. With Photoshop Elements, you can quickly add text to your photos that can easily be modified. Whether you want to create your own postcards, greeting cards, or add silly captions, Photoshop Elements has the tools you need. If you’re currently viewing the welcome screen, press the Edit button ( ) to enter the Editor workspace. In this lesson, you will discover how to add text to your images inside Photoshop Elements by using the Type tool. This first exercise will show you how to insert text at the bottom of an image, to label a photo. Later on, you will change the font, size, and location of this text. 1 Press the Organizer button ( ) in the Menu bar of the Edit workspace. This reveals the Organizer. 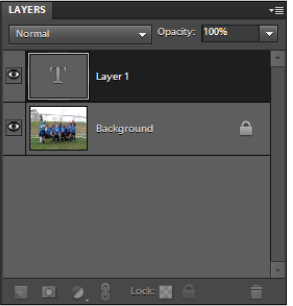 2 Locate the file named soccer.psd and select it. 3 Press the arrow to the right of the Fix tab in the menu bar and choose Full Photo Edit from the drop-down menu or use the keyboard shortcut, Ctrl+I (Windows) Command+I (Mac OS). Now that you’ve opened an image, you will explore how to add a type layer. You don’t actually have to build a new layer to insert type. When you click on an image with the Type tool (), Photoshop Elements automatically creates a new type layer. 4 Choose the Horizontal Type tool ( ) from the Toolbox. You can click and hold with your mouse on the Type tool to expose the hidden tools underneath to make sure you have the correct tool. 5 Click anywhere at the bottom center of this image. In your Layers panel, you should see a new layer named Layer 1 and you should also see a blinking cursor in the bottom middle of your screen. This is what a new text layer looks like. 6 Type Fall 2010 Youth Soccer. Dont worry about the size or font. In the next section, you will learn how to format the text. Now that you know how to place text in an image, you will learn how to change its size and font. 1 Using the Horizontal Type tool ( ) double-click on the text layer thumbnail to select the entire text. 2 Now that the text is selected, look at the Options bar at the top of the screen. The first option on the left is for changing the font. Use the drop-down menu to the right of the font name by clicking on the downward-facing arrow. You can choose any font you’d like, or if you’d like to follow along, choose Hobo Std. Choosing a new font from the drop-down-menu. 3 Make sure your text is still selected, and use the drop-down menu to choose a size for your text. You can choose any size you’d like, or if you’d like to follow along, choose 72. Choosing a size from the drop-down menu. 4 Even though the drop-down menu only goes up to 72, you are not limited to that size. Highlight 72 in the Options bar and type 80 and then click the green checkmark in the Options bar to commit your change. You should automatically see the change on your screen. If you need to reposition your type, choose the Move tool ( ) and move the text so it is centered in the image. Manually changing a font size. 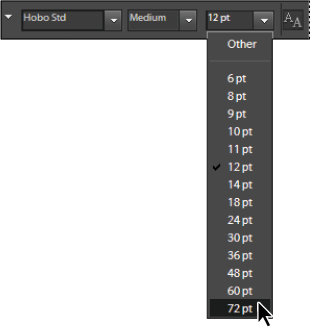 Another way to change any number value in any field inside of Photoshop Elements is to just click inside the field, either to the right or left, or even in the middle of a number, and then use your up and down arrow keys on your keyboard to change the value. This way, you can visually pick what size you want. Try it with your font name as well; you can preview how your text will look in all the fonts you have loaded on your machine! You should understand that since text is on its own layer, it is completely editable, even after you have deselected the text and closed the document, as long as it is saved in the .psd format. In this exercise, you will save the document, close it, and make some more changes to the text. 1 Save the file soccer.psd to your computer by choosing File > Save As. In the Save As dialog box, type soccer_work in the Name text field and make sure the format is set to Photoshop, and save it to the Lessons folder. Now, you will reselect the text, change the color, and change its position. 2 Select the Horizontal Type tool ( ) from the Toolbox. Click on the type; you should now see a blinking cursor in the type. Click three times in a row to select the sentence. Now that the type is selected, you can change the color of the type. 3 In the Options bar at the top of the workspace, click on the drop-down menu next to the color block. 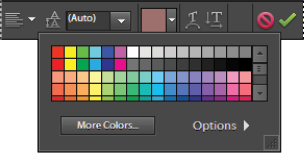 You can choose any color you’d like, or if you’d like to follow along, choose black, then click on the color block to close the color menu. Click the green checkmark in the Options bar to commit the change. Now that the text is a different color, you will change its position. 4 Select the Move tool ( ) Click and drag the text to the top of the screen and keep it centered. 5 Choose File > Save. If requested, enter a name and location to save the file, then choose File > Close to close the file.